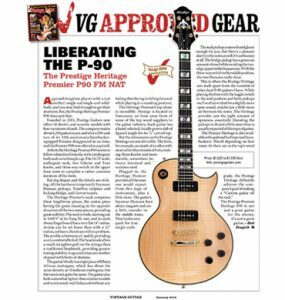 Liberating the P90 - Heritage Premier P90 FM NAT Review - Prestige Guitars Ltd. Approach longtime players with a (yet another) single-cut/single-coil solid- body, and you may find it tough to get their attention. But, the Prestige Heritage Premier P90 does just that. Founded in 2003, Prestige Guitars now offers 14 electric and acoustic models with four variations of each. The company makes about 1,200 guitars a year, and after a 200-unit run of its 10th anniversary/humbucker equipped Premier disappeared in no time, and the Premier P90 was offered as a spinoff. At first, the Heritage Premier P90 seems to follow a familiar formula, with a mahogany body and carved maple cap. The 24.75″ scale, mahogany neck, two Volume and Tone knobs, and three-way switch in the upper bout seem to complete a rather common iteration of the form. But dig deeper and the details are striking. All the hardware is top notch: Seymour Duncan pickups, TonePros tailpiece and locking bridge, and Grover tuners. The Heritage Premier’s neck comprises three lengthwise pieces, the center piece having the grain running in the opposite direction of the two outer pieces, providing great stability. The neck is wide, starting out at 1.6875″ at its Tusq XL nut, and its dark ebony fingerboard has a very flat 14″ radius. Action can be set lower than with a 12″ radius, yet barre chords are still no problem. The profile is between a C and D, providing a very comfortable feel. The headstock offers a much straighter pull on the strings than a traditional headstock, providing greater tuning stability. Logo and inlays are mother of pearl with hints of abalone. The guitar’s body is a single piece of Khaya African mahogany, which has about the same density as Honduran mahogany, but the tone is not quite the same. The guitar also feels somewhat lighter than similar models and is extremely well balanced without any feeling that the top is falling forward while playing in a standing position. The Heritage Premier’s top alone is incredible. Prestige is located in Vancouver, an hour away from of some of the top wood suppliers to the guitar industry. Each guitar has a hand-selected, locally grown slab of figured maple for its 3/4″ carved top. But the refinements on the Prestige Heritage are not all visible. The frets, for example, are made of an alloy with more silver than standard frets, making them harder and more durable, somewhere between standard and stainless steel. Plugged in, the Heritage Premier provides all the tones one would expect from this type of instrument, plus a little more. The guitar’s Seymour Duncans have alnico magnets and are a little rounder in the middle tones. They’realsovery quiet for true single-coils. The neck pickup is smooth and glassy enough for jazz, but there’s a pleasant clarityinthenotesaswell.It’snotboomy at all. The bridge pickup has a generous amount of snarl while avoiding the too edgy upper treble frequencies. With the three-way switch in the middle position, the two Duncans really shine. The Prestige Premier Heritage P90 is not just a great guitar for the money, it’s just a great guitar.